Team up with ClancyWorks to bring your students an unforgettable dance experience! Contemporary senior living environments focus on creating stimulating communities for their residents and members. ClancyWorks’ unique dance program for seniors has therapeutic as well as physical benefits, providing a comfortable setting for revisiting and attempting new movements with laughter and socialization to enhance overall quality of life. Each workshop is designed with the latest brain research in mind, creating an environment in which participants can excel, as well as structuring movement exercises that help to build and renew connections in the brain and rest of the body. Persons at all levels of agility, from fully ambulatory to those with walkers and wheelchairs, can participate in the ClancyWorks seniors dance program. 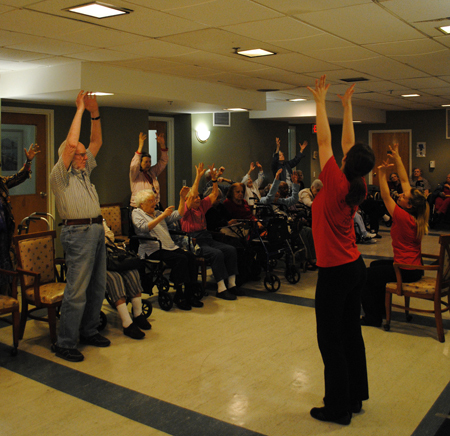 Each movement session includes exercises to foster effective brain stimulation, body coordination and therapeutic benefits. Past senior participants have shared a variety of positive comments on their enjoyment of the ClancyWorks program and memories of their own past experiences that resurfaced during the program. One individual stated that the performances were “nothing short of amazing!” In another workshop, a senior expressed her feelings through a drawing she created, which was inspired by the dancers. Overall, our program physically and mentally improves the individual well-being of the participants and helps to foster social connections among senior citizens within a community. ClancyWorks senior dance programs include a performance or demonstration by the ClancyWorks Dance Company, as well as a series of regular classes, in senior centers, resident communities and other appropriate settings. The Company’s work is particularly notable for its innovative and dynamic partnering work. This unique partnering work is not only an aesthetic statement, but also a source of powerful images that embrace diversity and exemplify trust. We work with a range of group sizes, and with a range of budgets to meet the needs of your seniors. Please contact us today to start the conversation about working with the seniors at your organization to help create a comfortable, stimulating and beneficial environment through scientifically-based, socially-engaged and fun-filled dance and movement sessions.